If you travel down to St David’s and explore the countryside below Carn Llidi you will find this lovely old farm called Treleddyd Fawr. However you cannot see it the way I have painted it. I have used a lot of artistic licence with this one. I like to paint buildings so that they are part of the landscape rather than dominating it and this view of the building is mostly obscured from this distance. To see the view like this I would have had to cut down a mass of overgrown hedgerows, several small trees and demolish a stone wall. I would also have had to hover about 100 feet up in the air to get the crag in this position. I sketched the building from several angles from close quarters and the roof and chimneys from a 100 yards back (this being all I could see from that distance). I then drew a lot of thumbnail sketches to work out the positions, angles and perspective until I was happy with the composition. 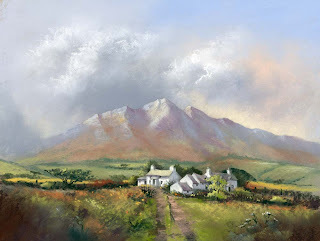 Making the landscape suit your ideas is what makes painting so exciting, so don’t be reluctant to change things to how you would like them to be.